We are a pizzeria that has a lot more to say about pizza then just ‘greasy, cheesy and filling’. We are on a mission to change the thought about pizza. 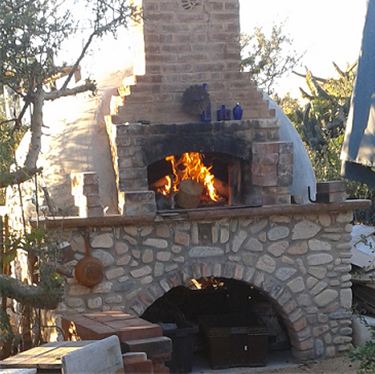 We have been inspired by the pizzas we ate in Italy and cooked in a brick oven. We believe that we can provide the community with a healthy variety of pizza. After experiencing pizzas from brick ovens we set out and built our own. Taking over two years to design and build it weighs in at almost 9 tons of rock and brick. Our pizza is simply the best you can buy. We offer many different varieties of pizza, ensuring that everyone has their favorite. We make our own pizza sauce from scratch, it slow cooks for over 8 hours at a time. Our low salt dough is made fresh each day and goes through two rise cycles. We believe we have found the right combination of pizza sauce and cheese so you can enjoy what ever toppings you want with a nice balance of that sauce and cheese. Our oven is our inspiration, wood fired it reaches temperatures over 1200 degrees so we can let it cool to about 800, what is what we believe is the best cooking temperature. At this temperature the pizzas cook in just seconds. The firing of the oven is a whole day process building and tending the fire, so come evening time it’s at its optimum temperature.